Call 702-462-9200 if you need a federal bail bond for the District of Nevada. We are licensed and authorized to post federal bail bonds at the Lloyd D. George US District Court in Las Vegas and any federal courthouse nationwide. The required premium for a federal bail bond is 15% of the bail amount. For example, if a federal bail has been set at $100,000 you can expect to pay $15,000 to a federal bail bondsman. Collateral can be pledged by anybody and is collected to ensure that the defendant will appear in court when required. 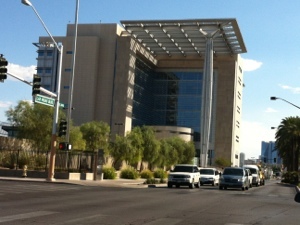 Federal Bail Bonds are different in that the Federal Court does not give any grace period when a court date is missed. The Federal Court will immediately demand payment of the full bail amount. Therefore, most federal bail bonds are collateralized by cash or other liquid assets. Once the defendant satisfies his obligation to the court and bonding company the collateral will be returned to the person that pledged it. Please call us at 702-462-9200 to further discuss cost, payments and collateral on federal bail bonds. We are licensed, bonded, insured and also accredited by the Better Business Bureau. Click here to visit our company website. Next post: How Much Does a Bail Bond Cost?